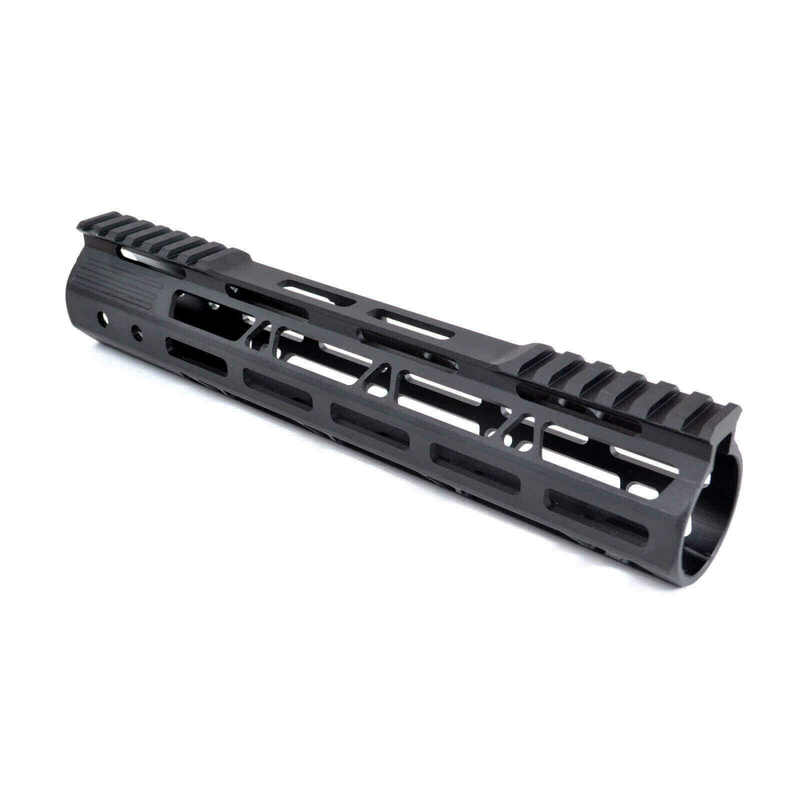 Based on the popular M-LOK™ platform, the AT3 PROLOK Free Float AR 15 Handguard is a lightweight, durable, and customizable M-LOK handguard at an excellent price. This item is an Open Box Return. There may be signs of light use such as scratches or other blemishes, but is complete and in working condition. The slim free-float design enhances accuracy, while minimizing the weight of your rifle. M-LOK attachment slots and 2 included rail sections provide unlimited options for accessorizing your build. The 10″ PROLOK handguard is ideal for customizing your next AR-15 build, or upgrading an existing rifle. IMPORTANT NOTE – the barrel nut requires a 30mm (1 3/16”) wrench (not included). Most AR-15 Armorer’s wrenches will work for this, or we recommend using an armorer’s wrench or 30mm (1 3/16”) crowfoot with torque wrench. Full kit – includes all mounting hardware plus two M-LOK 3-Slot Rail sections – all included parts pictured below. Note: most rifle setups will require the use of a low profile gas block that sits under the handguard. Will this fit my AR-15? This handguard will work with the majority of mil-spec AR-15’s on the market. In most instances, it will also require the use of a low-profile gas block that fits underneath the rail. This product will not work with non milspec upper receivers like the Bushmaster Carbon due to the non-standard barrel threads, and it is not compatible with most piston kits as they won’t fit under the handguard. We’re always glad to verify the fit for your rifle, just contact us! And if it doesn’t fit, we are glad to return it for you. And if you’re new to AR-15, we recommend watching a couple of the videos on our installation video page to understand how the process works. What tools and additional parts are required? For parts – most setups will require a low profile gas block.